We offer educational guided tours for elementary to college level students as well as organized community groups of 10 or more. Tours provide visitors with background information on the exhibit content as well as and engaging experience in observation, and discussion and meaningful personal connections. There is no admission fee for these tours, but reservations are required. Imagine the Schaefer Gallery as your classroom! ARTWORKS guided education tours focus on exhibits in the Gallery, and are designed for Grades 3 through 12. Tours are tailored to compliment the content of each exhibit and provide an informal creative setting for student participation. 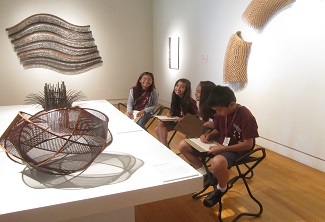 All tours meet the Hawai'i Learning Standards for visual art and integrate into other core curriculum areas. Students are engaged through viewing, responding, and hands-on activities. Teaching artists work directly with students to help them understand artistic concepts, process, and techniques. -Suggested timing is 9:30-noon, weekdays. -Students should wear clothing they can get 'messy - and bring a healthy snack .